When the San Francisco 49ers traded Alex Smith and named Colin Kaepernick the starting quarterback, I heard from more than a few die-hard 49er friends that it was a bad idea. (Bizarrely, some of them still think that.) I told them at the time that they were wrong, and I still bring it up with some of them (not surprisingly, they want me to stop. Okay, I'll just forget the time you swore off the team you've rooted for since you were eight. No, I won't forget that. Loyalty, people. Look it up). The biggest reason I liked Kaep over Smith had nothing to do with their stats, it had to do with, for lack of better word, is magic. You could use the word “watchability,” but that doesn't cover it. You saw the magic in the NFC championship game Sunday against Seattle, when Kaep took off for 58 yards. That's kind of magic, the ability to make something out of nothing. Kaep has it, Joe Montana and Steve Young had it, even Jeff Garcia had it for a decent stretch. Great quarterbacks have that, and Smith doesn't have that. Which is why during the NFC title game, I heard myself saying that “Kaep's career will be a short one.” I don't quite know where that came from- maybe I've seen too many magic QB's like that have short windows of opportunity. You can argue that Robert Griffin III's window has already passed. Michael Vick. Tim Tebow, even. Magic QB's with very short windows. Kaep's window is open, but that 49ers defense is aging, and who knows when they start to fail. 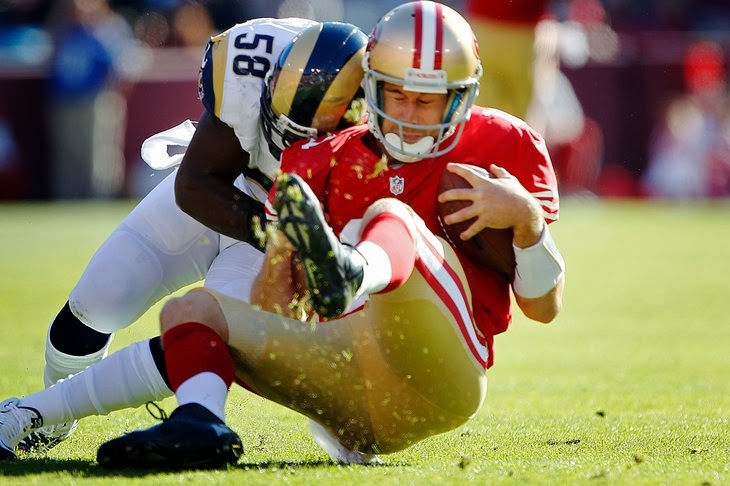 Kaep will be a better QB in three years, but where will the 49er defense be? What about salaries and salary caps and all that? Kaep's best chance to win the big one is now. He needs a boost from somebody to make sure next year is the year. 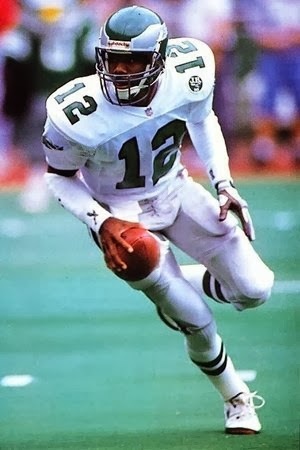 So with that in mind, I turned on NFL Network's marvellous series, “A Football Life,” and picked out what, at first thought to me, appeared to be a random episode I hadn't seen, the one on Randall Cunningham. It's fairly clear in the documentary that Randall's best season as a quarterback did not occur with the Eagles, the team he was drafted by in 1985, but 13 years later, with the Minnesota Vikings team that went 15-1 in the regular season and should have played John Elway and the Broncos in the Super Bowl. Even though Randall was in his mid-30's, he was still able to run, and still had a great arm- and now he realized that when you have Cris Carter and Randy Moss at their peaks, you don't have to run all the time. At this point I realized that Colin Kaepernick needs to go to Las Vegas and hang out with Randall Cunningham during the off-season. Kaep could do what Randall failed to do, which is win a Super Bowl. Even though Kaep's head coach, Jim Harbaugh, was an NFL quarterback, he was not a Randall Cunningham type. There can't be a “Randall Cunningham type,” because RC is one of a kind. Kaep could be “Randall 2.0,” but Randall's career was salvaged in the mind of public perception by that 1998 season, no matter that the Vikings lost the NFC title game. To win a Super Bowl with this group of 49ers, Kaep needs the knowledge that Randall Cunningham had in his 13th year of professional ball. Kaep needs to make Randall tell him everything, because Randall has the best chance of knowing what Kaep is going through right now. He can relate to him as a young mobile QB with a rocket arm and more than a bit of an “I'm the Greatest” mindset, and show him where he can be if he realizes the things Randall took more than a decade to learn. Although I don't think Kaep could ever punt like that. Now, it's not all on Kaep's shoulders... the 49ers receivers aren't exactly Randy Moss and Cris Carter, even when they're all healthy. But as opposed to Randall's early days, the 49ers not only are receptive to Kaep's magic, they encourage it. If Randall helped him out too? Off the charts watchability. I think they're more alike than either of them have considered. They both went to school in Nevada (RC to UNLV, CK to Reno), and were under-the-radar picks in their respective drafts- Kaep was considered good but a reach in the 2011 second round, Randall was also taken in the second round and was considered a reach in the 1985 draft. It should not be too surprising that Kaep was the 36th overall pick, and Randall the 37th. Both are listed at 6-foot-4, with Randall's playing weight at 215 and Kaep's at 230. As I have mentioned, both have rockets for right arms and both have the magic. It would be terrible if Kaep and Randall didn't meet until Kaep's career was on the downswing. Randall is a preacher and a teacher, so I suspect that he would welcome Kaepernick and some inquiries on how to be a successful magic QB. Randall appears open to the idea; last year he said he was pulling for him to succeed. Randall's not the only one. Even if it's just so we can tell our friends that Kaepernick is better than Alex Smith, one more time.